Why do you show a dragon but hide a tiger, or why do you spin a gold coin on the floor? These are some of the secrets the course participants find out. How would you immobilize a monkey and take him for a walk, and how would the monkey free himself from your grip? Certainly Shaolin patterns are not only poetically named and beautiful to watch, they are also highly effective for combat as well as full of fun. Grandmaster Wong explains about and demonstrates some secrets of the pattern “Bow-Arrow Thread Bridge”, found in the Tiger-Crane Set. You may use this pattern to release your opponent's grip on your wrist, and strike his vital points. The pattern “Bow-Arrow Thread Bridge” is also called “Show Dragon Hide Tiger”, the first being its technical and the second its poetic name. Sometimes body-movement is required. It is similar to the pattern “Swimming Dragon Plays with Water” found in the Dragon-Form Set. Grandmaster Wong shows a secret of the dragon-hand in the pattern “Swimming Dragon Plays with Water”. “Show Dragon, Hide Tiger” may be used in a similar way. Sifu Anthony asks about the pattern “Horizontally Sweep a Thousand Armies” which is technically called “Horse-Riding Hand Sweep”. 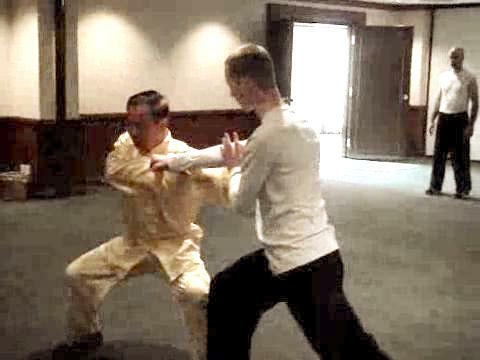 In return Grandmaster Wong asks what he thinks is its combat application, and Sifu Anthony demonstrates it. Grandmaster Wong suggest an improvement with footwork. 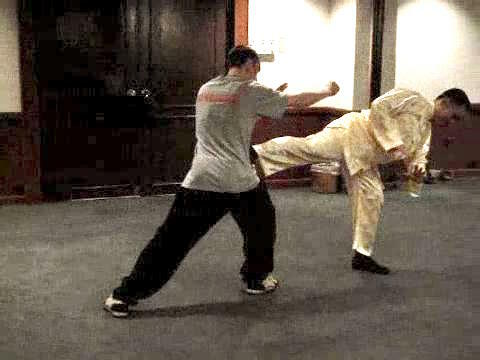 Grandmaster Wong demonstrates a secret of the Tiger-Tail Kick, which is poetically called “lazy Tiger Stretches its Waist”. This pattern is found in the Tiger-Crane Set. The size of the video clip is 0.34 mb. Sifu Roland asks about the pattern “Gold Coin Spins on Floor”, which is from the Monkey Set. Grandmaster Wong shows how this pattern is performed. It has some amazing combat applications. Grandmaster Wong reveals the secrets of some Monkey patterns. The signature Monkey pattern “Spiritual Monkey Emerges from Cave” is tricky and deadly. If an opponent manages to ward off the attack, you can immobilize him and take him for a walk using the pattern “Hide Peach in Armpit”. He may counter with “Spiritual Monkey Washes Face”. 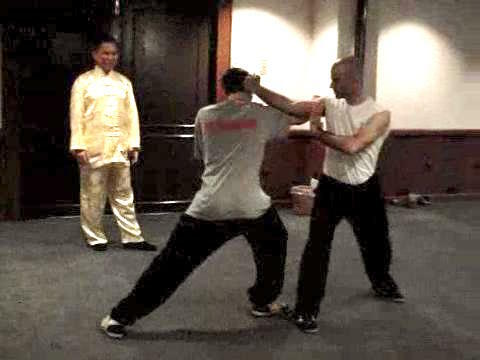 Profundity of Shaolin Combat Application from Wong Kiew Kit on Vimeo.